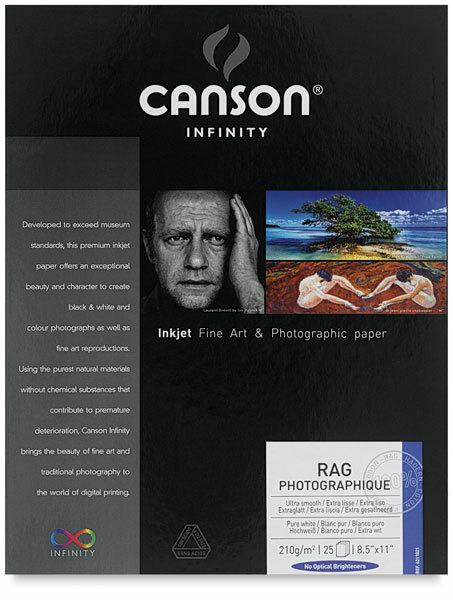 Rag Photographique is a 100% cotton, museum-grade white fine art paper developed by Canson to meet the longevity requirements of the digital fine art market. The natural minerals used in its manufacture render an extra-smooth white surface with a sensual feel and one of the highest Dmax ratings available. It is ideal for fine art photography as well as fine art printmaking. Rag Photographique is compatible with pigmented and dye inks, dries instantly, is water-resistant, and contains no optical brightening agents. Internally buffered and acid-free, it was designed to meet the longevity requirements of galleries and museums.